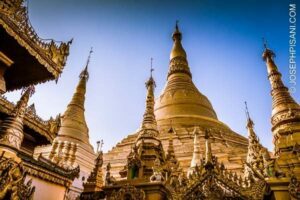 Adventure Travel Medical Detour: From Burma to Bangkok! Shwedagon Pagoda, Myanmar — one of the few places we could visit before having to evacuate to a hospital in Bangkok. I thought I had really seen it all, up until Nici and I became quite ill a few days ago in Yangon, Myanmar. Now, going into this trip, I knew the last place anyone would want to visit while traveling here, aside from a military prison, was a Burmese hospital. Unfortunately, after running a high fever for a couple days, I was “lucky” enough to do just that! Following some great support from two doctor friends back at home, our first step was to take antibiotics. We each had some with us, but they were not necessarily the best kind for this particular situation. We also didn’t have a thermometer to correctly gauge how high our fever actually was. So, I set out to get us some medical supplies and stock up on some much needed water. After inquiring in the hotel about a pharmacy, I was directed to the nearby hospital’s pharmacy. Since it was right next to our hotel, this option seemed like the best one at the time, especially considering my rather sick, weakened state. It was already getting dark as I made my way there, avoiding stray dogs and traffic. Through the hospital’s flood lights, the exterior of the colonial style building imposingly stood before me. It was fittingly painted in deep red and glowing in the night, like a scene right out of a Hitchcock film. Outside the gates, peddlers hawked trinkets and strangely scented meats cooked on makeshift barbecues. The pungent smells mixed with the humid night air and stirred my already faint will. Still, I pushed forward along the garbage-strewn path, towards one of many entrances, passing ghost-like patients riding antique stretchers. The pharmacy couldn’t be that difficult to find, I thought to myself, trying to calm myself as my feverish forehead continued to pound and drip sweat in an almost unison rhythm. He pointed behind him and upwards, and then proceeded to spit red betel-nut saliva into a cup he was holding. I asked again when I approached what looked like the reception desk. There they again pointed in the same upward direction. One woman in a nurse-like hat looked at me and said, “three, go floor three,” and started walking with me towards an old elevator. The doors opened with a long squeal and I was greeted silently by an old lift attendant dressed in dirty gray and sitting on a small plastic stool. I hesitantly stepped inside the dimly lit compartment as the doors crept closed behind me. The man pressed button number three without even asking, and a swarm of mosquitoes danced around his head as the elevator crawled and creaked upwards. Two woman and a nurse standing there all pointed to the door at my right. Surely all these people couldn’t be steering me wrong, I told myself, despite the very strange feeling that there couldn’t possibly be a pharmacy on the other side of the door. I knocked and waited. Someone opened the door, inviting me in. In the corner of the room, a pregnant, western-looking woman was sleeping, curled up without a blanket, on a worn mattress that sat atop a bare metal bed frame. The room was otherwise empty. Startled, I quickly excused myself with a low-spoken “sorry,” and quickly reversed out of the room. This was much to the amazement of two women and the nurse that had led me into the room–they continued to point, almost pushing me back towards the sleeping pregnant woman. Without giving any explanation, I made my way back down the hall, where I was met by the man in the lab coat that I had first asked. He too looked at me quite puzzled, and began speaking to me in language I didn’t understand, as he pointing back to where I had came. I just pushed by him rather rudely, passing the opened elevator doors. Then I turned and jogged down the three flights of stairs, still noticing the stains on the floors, and the dust that had collected in the corners of the stairway. Back on the ground floor, the hall began to spin in my head as I searched for a way out. I ignored the nurses at the reception who all seemed to protest that I was going in the wrong direction. At the end of a hall, I saw an illuminated white sign with green letters. Surely that had to be the pharmacy, I thought to myself. A man behind a small desk, surrounded by few nurses looked up from his paperwork, while spitting red betel nut juice into a cup on his desk. “yes, what do you need?” he replied. He then turned back to his desk without another word, and I left, trying to find my way out of this haunted compound. The moral of this episode is, assuming anything, especially in a foreign country, can end up making for a great adventure travel story. Wow, what a story! I’m planing on going to Myanmar in the Spring. Would you still recommend it? I would have if it wasnâ€™t so much of a hassle to get another Visa. Went to Nepal instead. Maybe next time around. Have a great trip! get updates. Where can i do it? Sounds like an exciting and fun nightmare.